the Defendants to silence their reports of widespread criminal activity inside City Hall. SAPD. 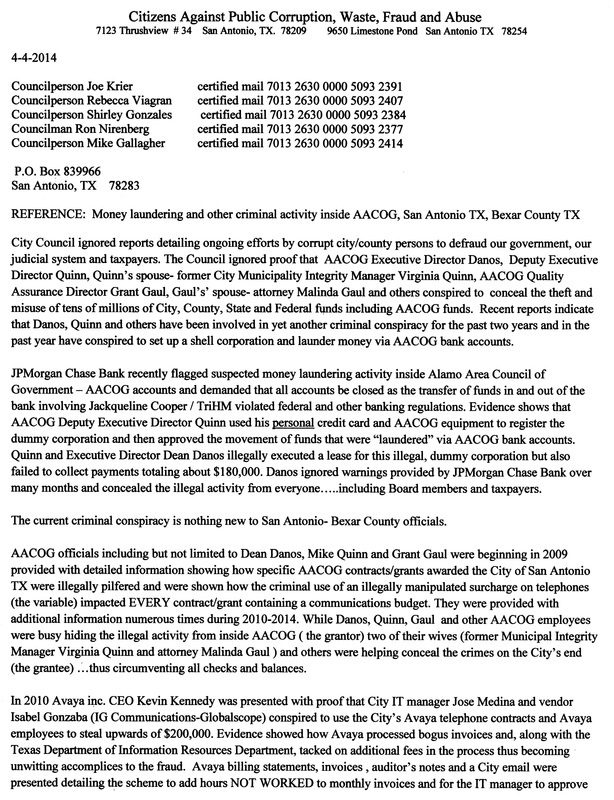 BCSO, AACOG and our Courts. Local Government Code, GSA rules and OMB regulations using "cooked" books concealing decades of theft/fraud involving tens of millions of dollars would put the deal in jeopardy. 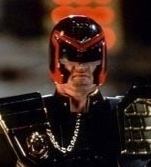 Defendants of the dire consequences of following the law. Aggravated Perjury and decades of criminal activity by public officials to stand in the way. 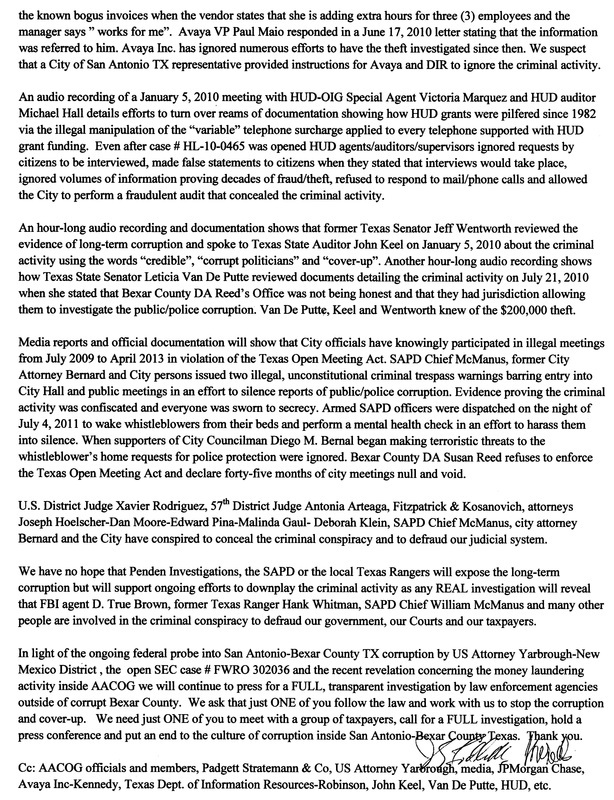 SAPD , the DA’s Office, BCSO and our Courts. Susan Pamerleau , the local FBI, the local DOJ City / County officials and many others. in their pocket blocking any enforcement of the Texas Open Meeting Act and other laws, etc. aggregated perjury / fraud upon the court while they played along with the criminal cover up. telephone contract) to be processed across state lines ( 288 separate cases of mail/wire fraud). Rodriguez ignored the fraud upon the 57th District Court concealing the criminal activity. 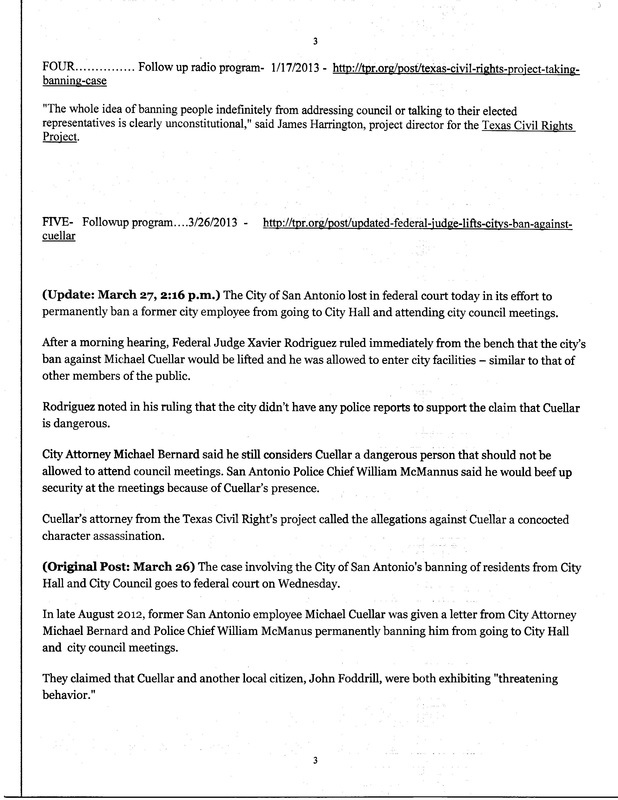 Bexar County DA LaHood refuse to enforce the TOMA in an effort to protect their friends. played along with the criminal conspiracy. This unholy alliance will soon end. the participants in the criminal scheme have conspired over the years to conceal the RICO-like criminal conspiracy. A criminal investigation should expose the "favors", "rewards", etc. received by attorney Joseph Hoelscher and attorney Dan Moore for their part in helping to conceal the ongoing criminal conspiracy and the "Fraud Upon Our Court System." Attorney Edward Pina was paid to expose the criminal cover-up and have the illegal ban lifted. 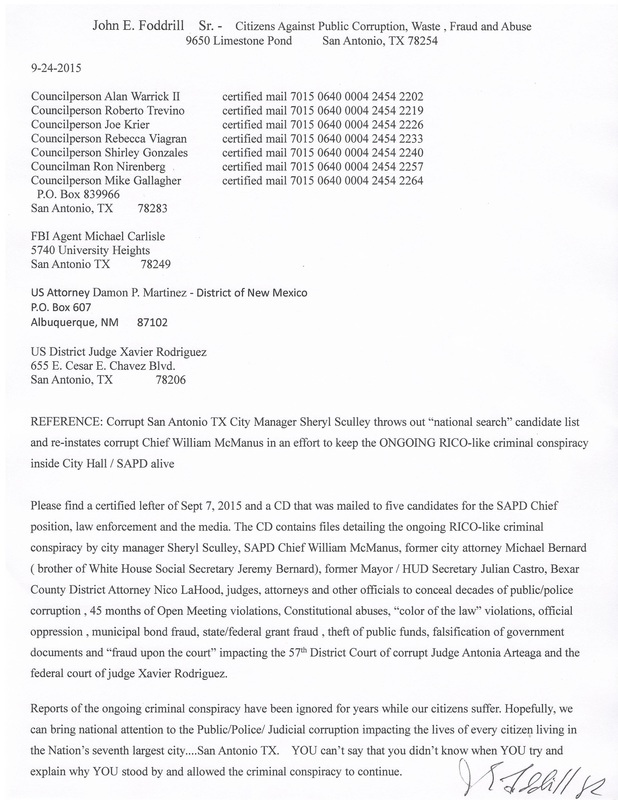 Attorney Kathleen Cassidy-Goodman was hired to appeal the ruling by corrupt 57th District Judge Antonia Arteaga based upon a "fraud upon the court" by ALL the attorneys involved. 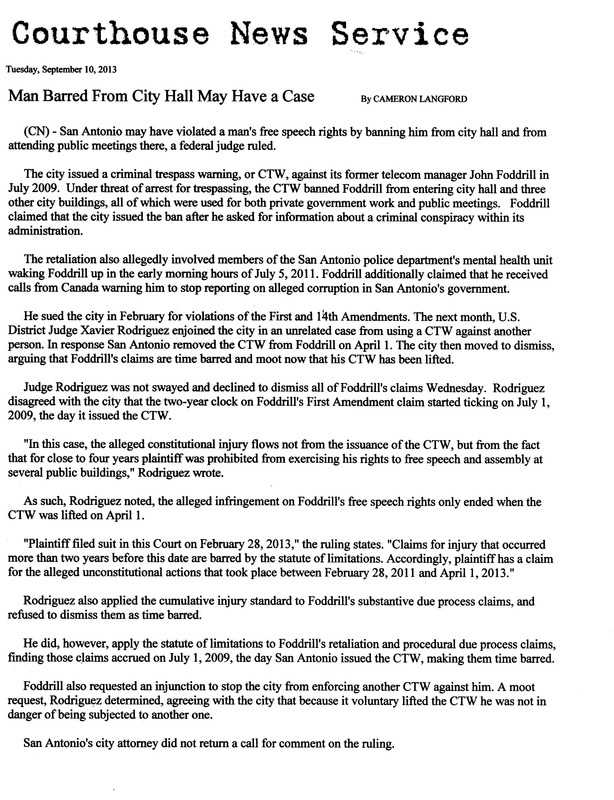 Pina stalled, allowed city attorney to lie, actually supported the City's actions and refused to follow the law and his oath. Goodman submitted a worthless appeal lacking required documentation, refused to expose the "fraud upon the court" and helped cover up the criminal conspiracy on the advice of attorney Edward Pina. A criminal investigation should expose the benefits both Pina and Goodman received for stalling, concealing the criminal conspiracy and helping defraud our Judicial System. 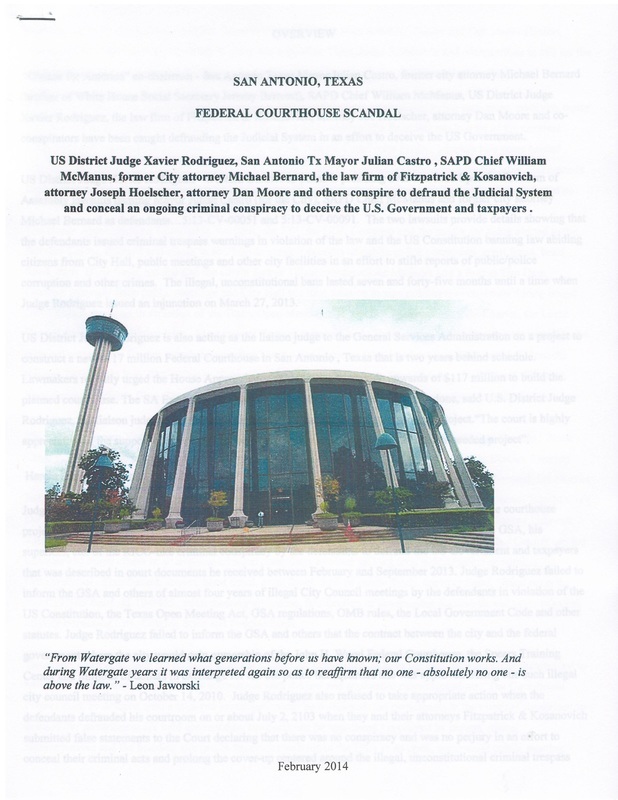 Federal Judge Rodriguez and numerous City / County officials in addition to exposing the illegal Courthouse project covered in additional pages on this site. 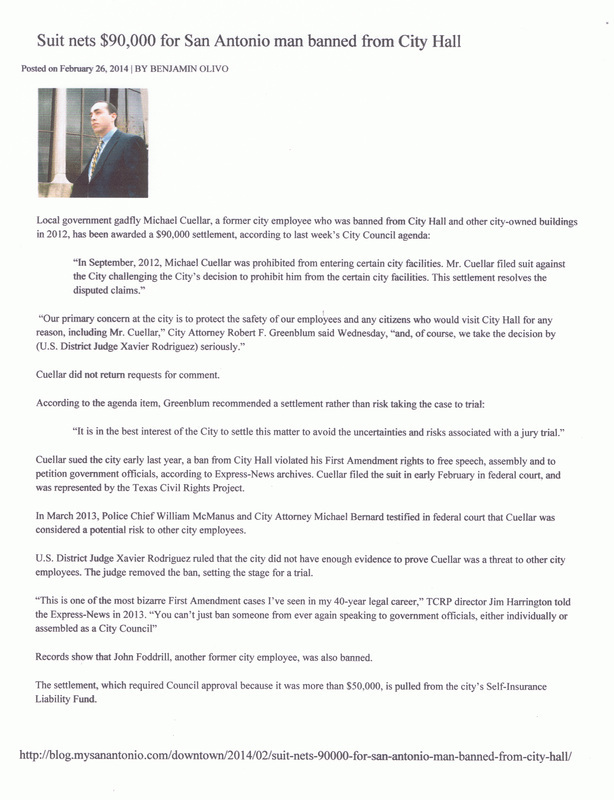 Michael Cuellar was the other whistleblower banned from City Hall and public meetings to silence his reports of corruption. Michael agreed to not disclose his evidence of corruption inside the SAFD and the City and was awarded $90,000 after being banned seven months. 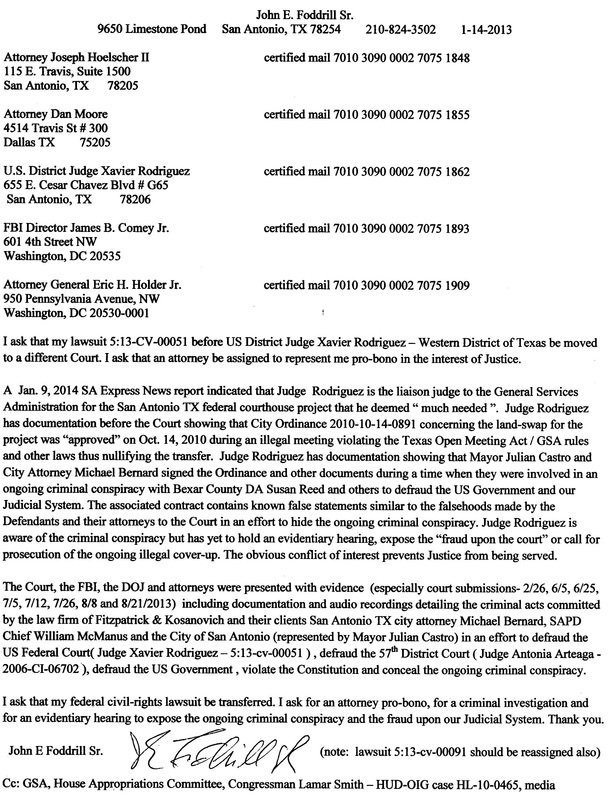 This sworn affidavit details how the law firm of Fitzpatrick & Kosanovich lied to Federal Judge Xavier Rodriguez in an effort to conceal their lies to 57th District Judge Antonia Arteaga and the ongoing criminal conspiracy . The FBI, the DOJ, the Court, law enforcement, etc. ignore the facts. On October 14, 2010 City Officials approved an ordinance involving the Fedeal Courthouse and other Hemisfair Park property during an illegal meeting violating the Texas Open Meeting Act, GSA regulations, the City Charter, the Texas Local Government Code and other laws when whistleblowers were banned to silence them. 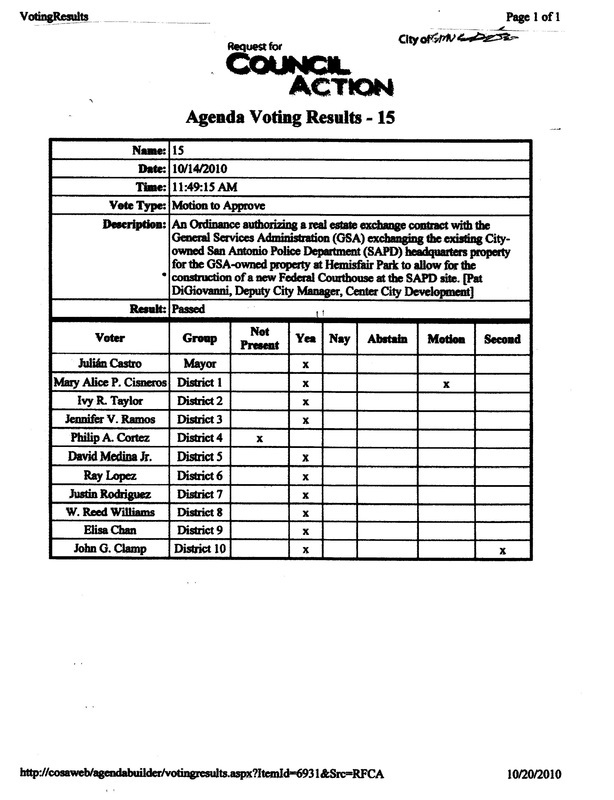 The GSA and Congress were made aware of the Texas Open Meeting Act violations, the illegal meetings and the illegal transfer of Hemisfair Park property, the Federal Courthouse, money and City property. They ignored our reports. 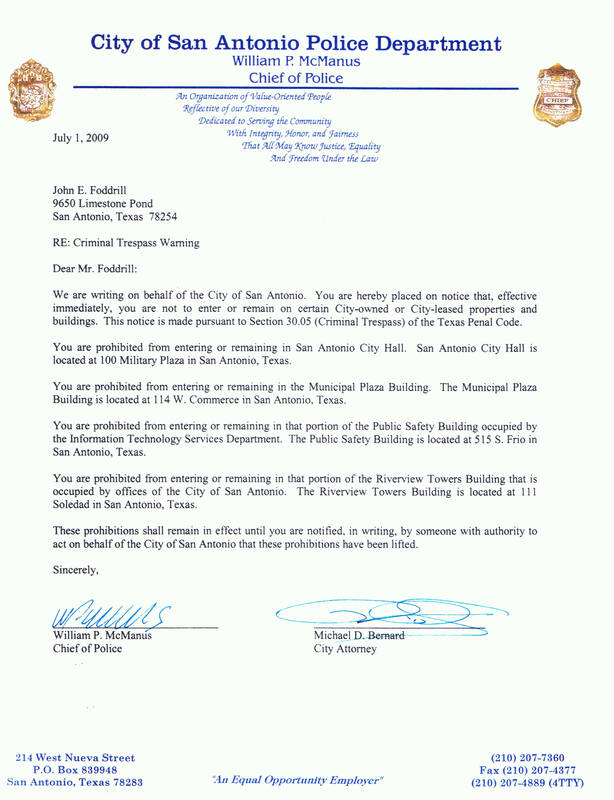 San Antonio TX City Attorney Michael Bernard ( brother of White House Social Secretary Jeremy Bernard) issued two illegal, unconstitutional criminal trespass warnings banning whistleblowers from City Hall and public meetings in an effort to silence them and conceal the fact that he was conspiring with other corrupt persons to cover up DECADES of corruption , Judicial Fraud, "cooked" books, official oppression, perjury, falsification of government documents and other criminal activity. Neither whistleblower was a threat. Neither had committed any crime. Neither had caused any disturbance. Neither had been asked to leave any public event. There was no threat of bloodshed. 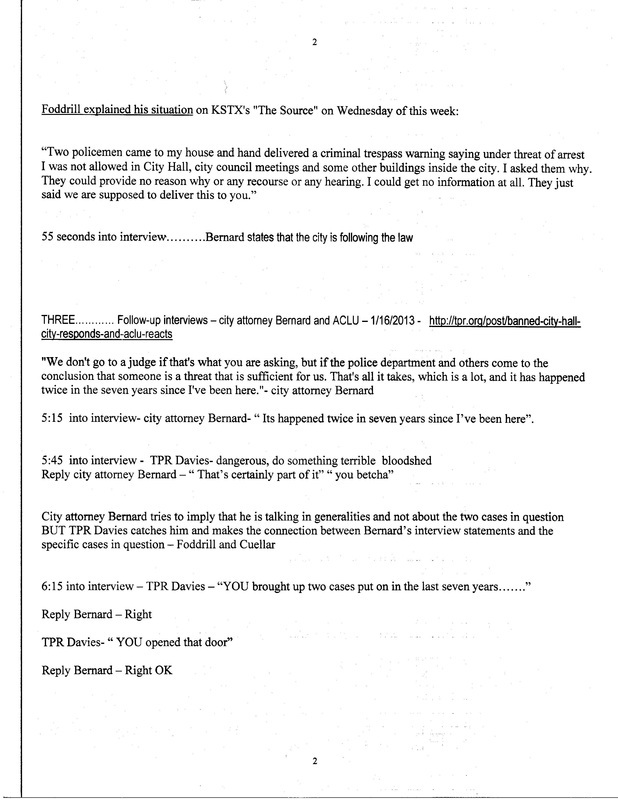 Bernard LIED to cover up his own ongoing criminal conspiracy. 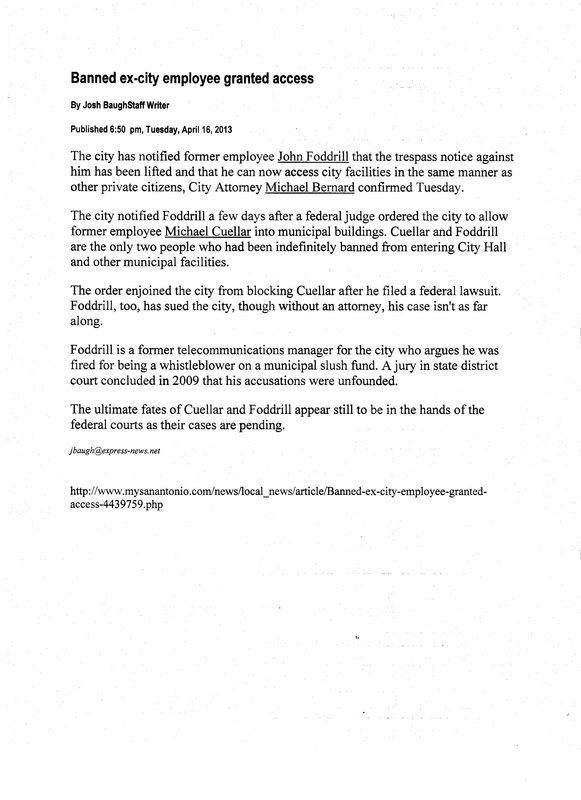 Defamation by city attorney Bernard - page 3. 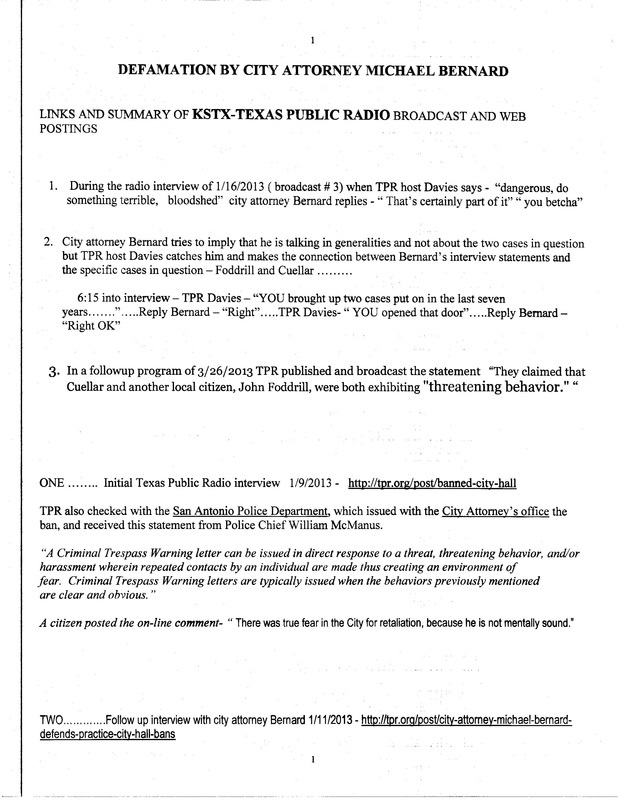 Attorney Joseph Hoelscher and attorney Dan Moore stated in 2013 that they were amending the original lawsuit to include information concerning the defamation by city attorney Bernard. Hoelscher and Moore were lying as they stalled, never submitted an ammedned lawsuit, never submitted a motion for an evidentiary hearing to expose the "Fraud Upon the Court" and underlying criminal acts of the Defendants. 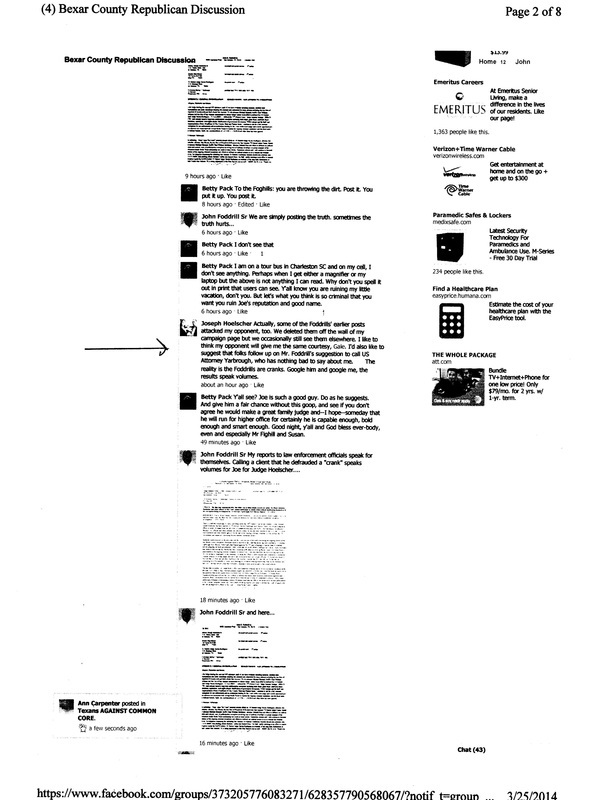 Hoelscher and Moore played along and Hoelscher published his own defamatory comments on a public forum to conceal his own part in the ongoing cover-up. 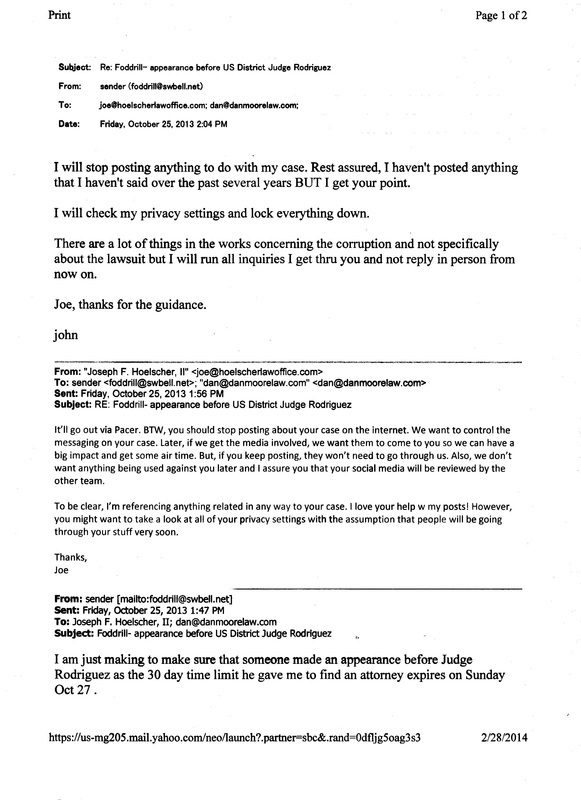 Attorney Hoelscher and attorney Moore refused to reply to this correspondence with their client. Law enforcement including the FBI and DOJ play along with the criminal cover-up. 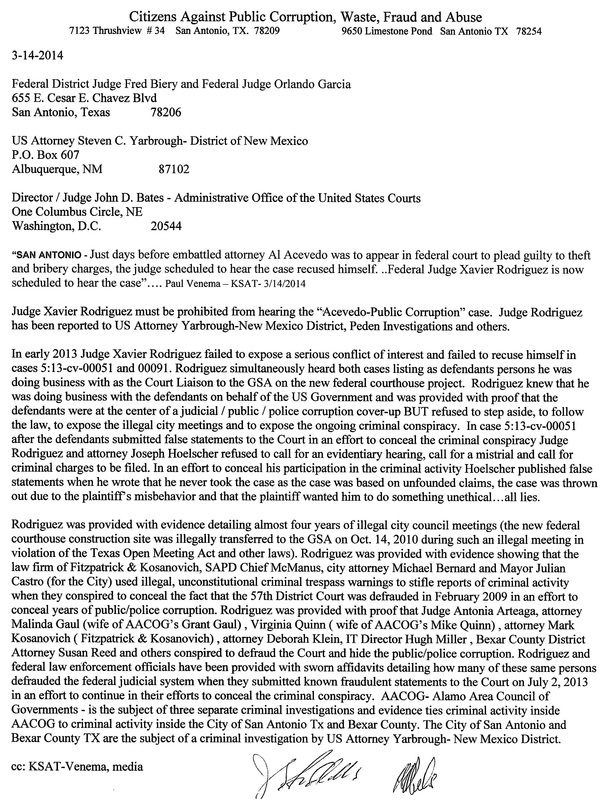 Judge Rodriguez refuses to respond BUT this certified correspondence proves that Rodriguez knows of the criminal conspiracy and illegal agreements concerning the Courthouse Project but has kept the crimes and illegal dealings hidden. 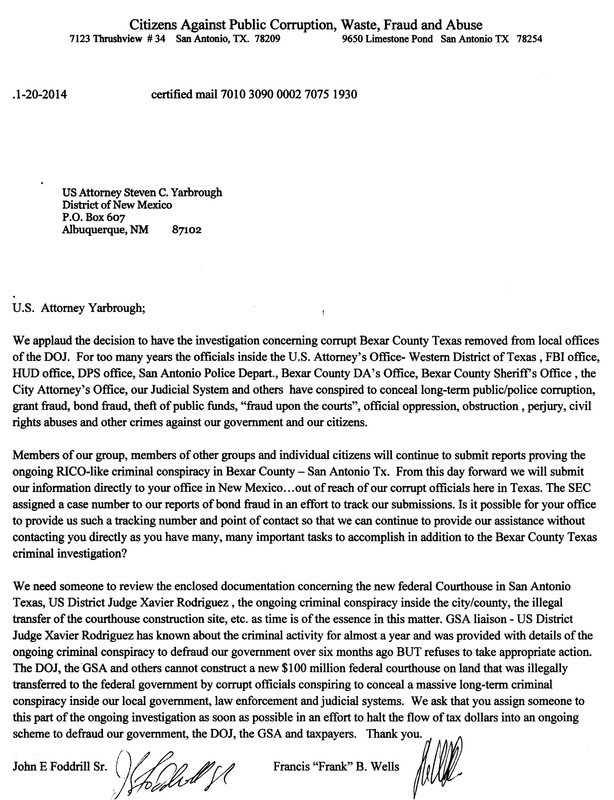 Yarbrough did NOT reply to this correspondence reporting criminal activity to the DOJ. 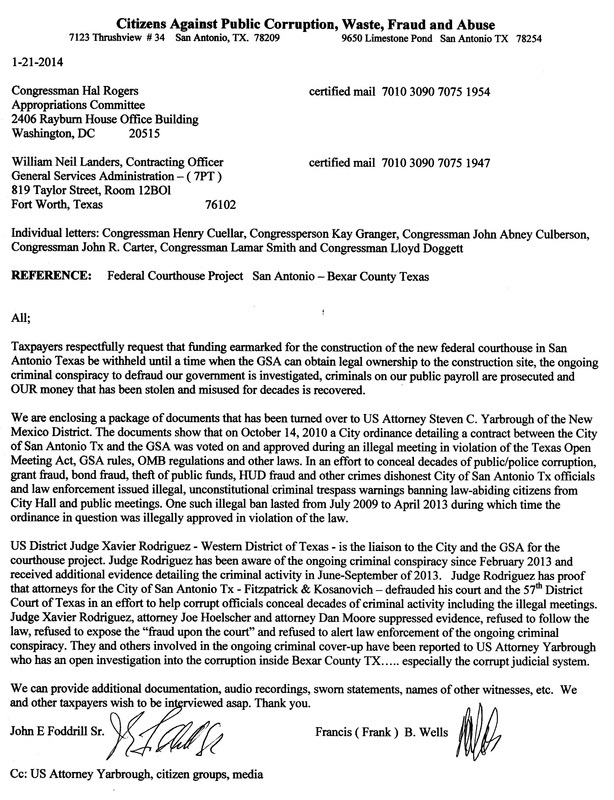 Yarbrough did NOT respond to this correspondence reporting criminal activity to the DOJ involved in an ongoing investigation into corruption inside the Bexar County Courthouse. 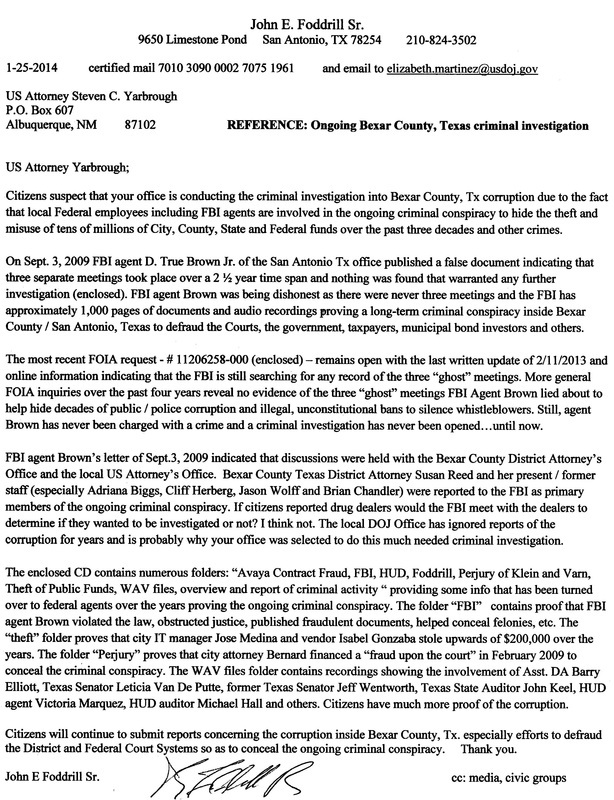 Yarbrough did NOT reply to this correspondence proving that San Antonio TX FBI agent D. True Brown lied in an effort to help conceal the fraud upon the 57th District Court, the illegal criminal trespass warning of July 1, 2009 and other criminal acts by City officials. Federal Judges and US Attorney Yarbrough refuse to expose the corruption, the illegal bans and fraud upon the court. Citizens requested to ba able to attend meetings while they were banned and continue to as for "safe passage" to attend meetings after the bans were lifted. Citizens fear being arrested on trumped up charges where they could be found hanged in the Bexar County Jail before they can post bond. City officials have refused to reply to correspondence. 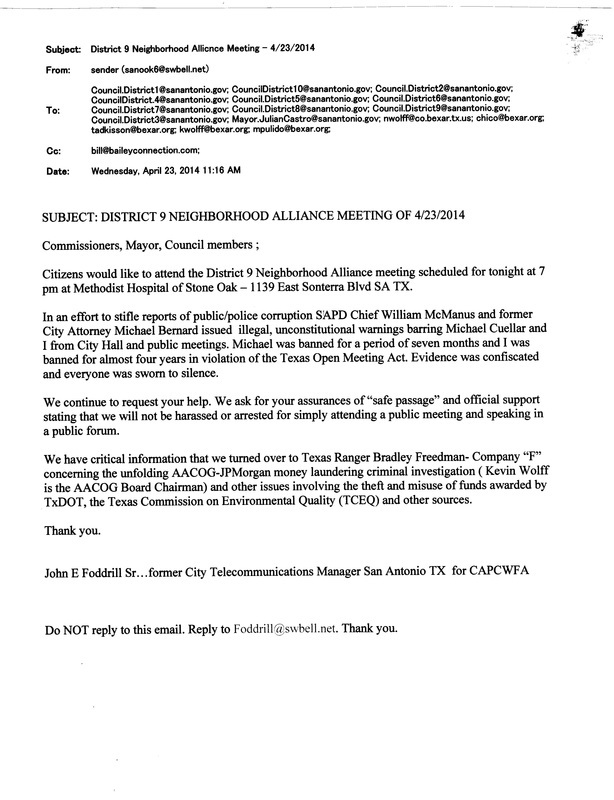 As a new Councilman Joe Krier was provided with information concerning the criminal cover-up, the "cooked" books, the illegal meetings and the Federal Courthouse Scandal....Krier ignored all correspondence . 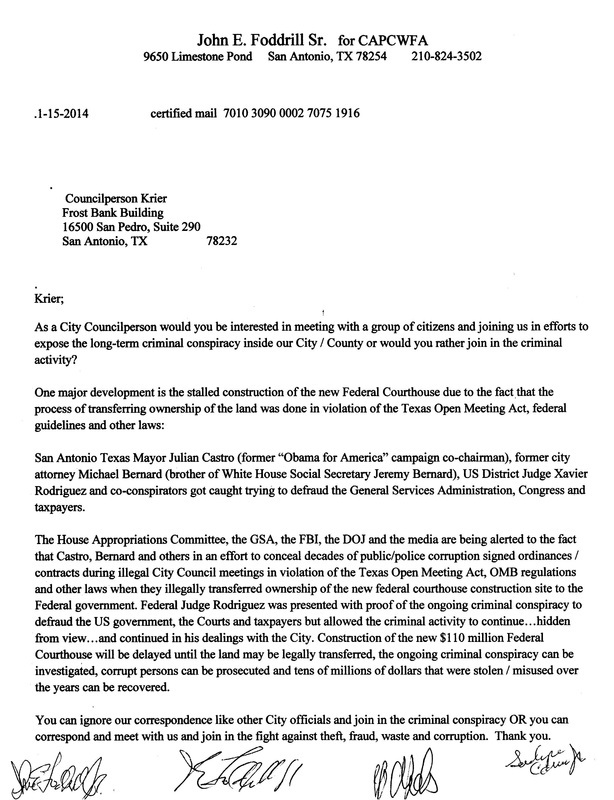 City Councilpersons were provided with proof of the ongoing criminal conspiracy involving the Federal Courthouse Scandal. They ignored our correspondence...as usual. 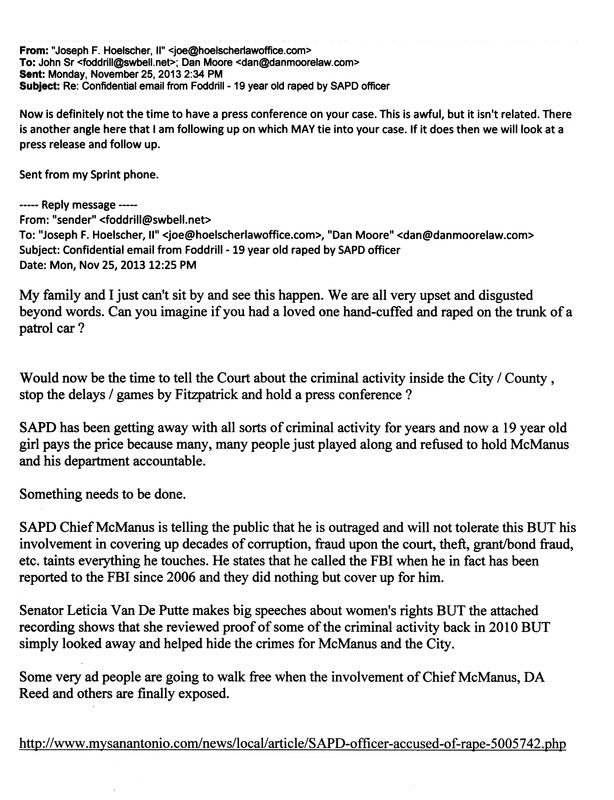 Attorney Hoelscher REFUSES to hold a press release even AFTER corrupt SAPD Chief McManus pretends to be upset after a cop rapes a handcuffed, pregnant 19 year old on his squad car. 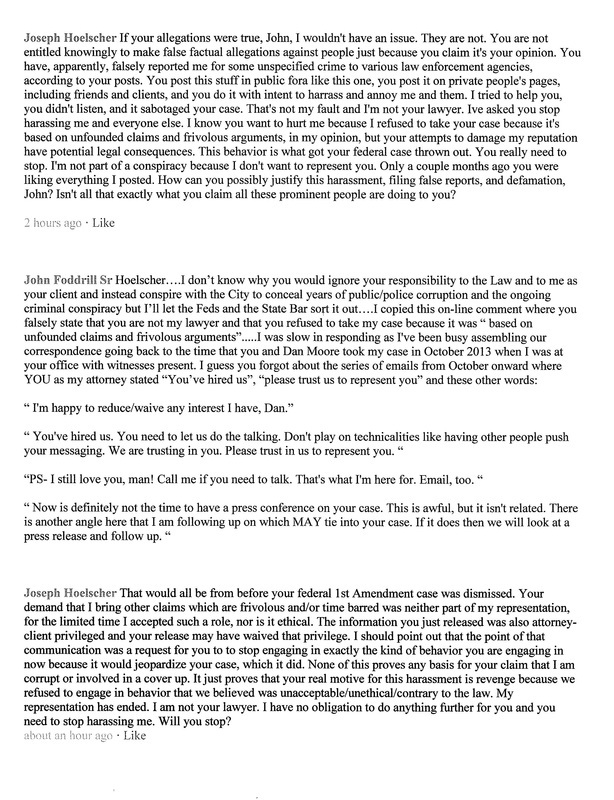 Attorney Hoelscher makes defamatory comments on a public FaceBook page in an effort to cover up his participation in a conspiracy to defraud the Federal Court and hide DECADES of criminal activity. Hoelscher falsely states that he refused to take the case. He falsely states that his client refused to follow his advice and this is why the case was dismissed. He falsely states that the case was based upon unfounded claims and frivolous arguments. He falsely states that the client sabotaged his own case. Hoelscher was provided with a "fraud upon the court" by the Defendants when he was hired. Hoelscher and attorney Dan Moore stated that they were filing a motion for an evidentiary hearing and amending the lawsuit to cover defamation . Hoelscher and Moore did neither and stalled. Now he lies. 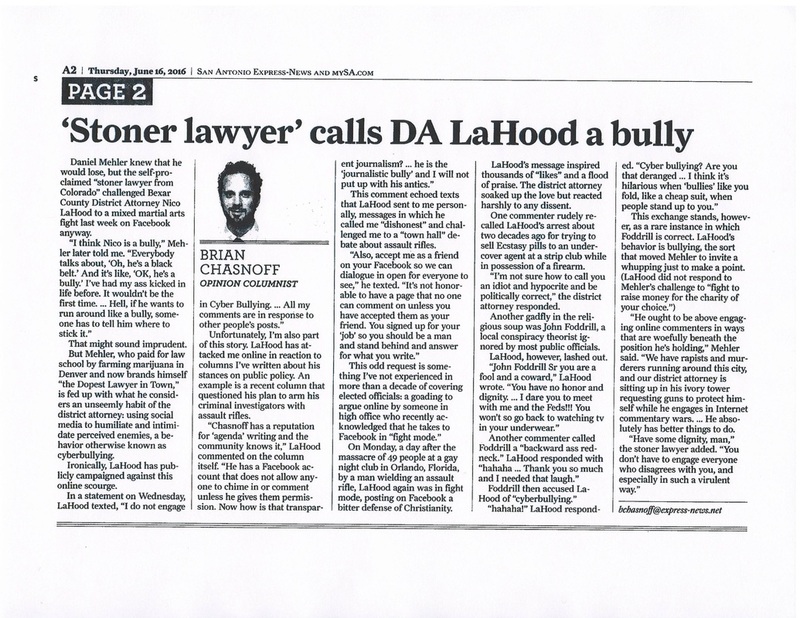 The SA Express News published an article detailing the cyber-bullying of the City's former Telecommunications Manager / Whistleblower by Bexar County DA Nico LaHood. 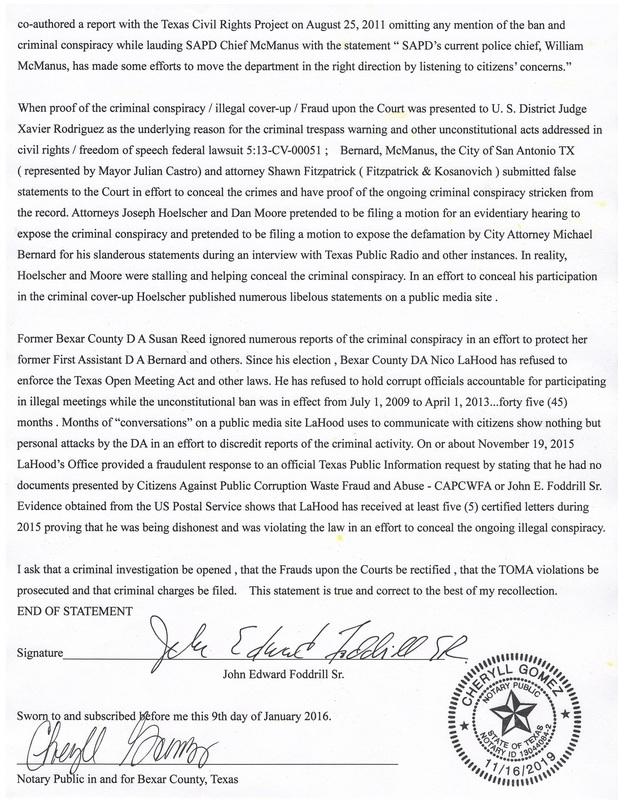 In an effort to conceal the Federal Courthouse Scandal and other public/police/judicial corruption LaHood refuses to enforce the Texas Open Meeting Act and defames Mr. Foddrill on a public FB forum.....Screen-shots of LaHood’s public FB page show LaHood bulling the City’s former Telecommunications Manager and calling him worthless, a liar, a political hack, the Foddrill type, insignificant, a troll ,a coward , “FRAUD-rill” and other names in an effort to discredit reports of the public / police / Judicial corruption. …...Lying LaHood has his own page detailing his criminal activity on this site. 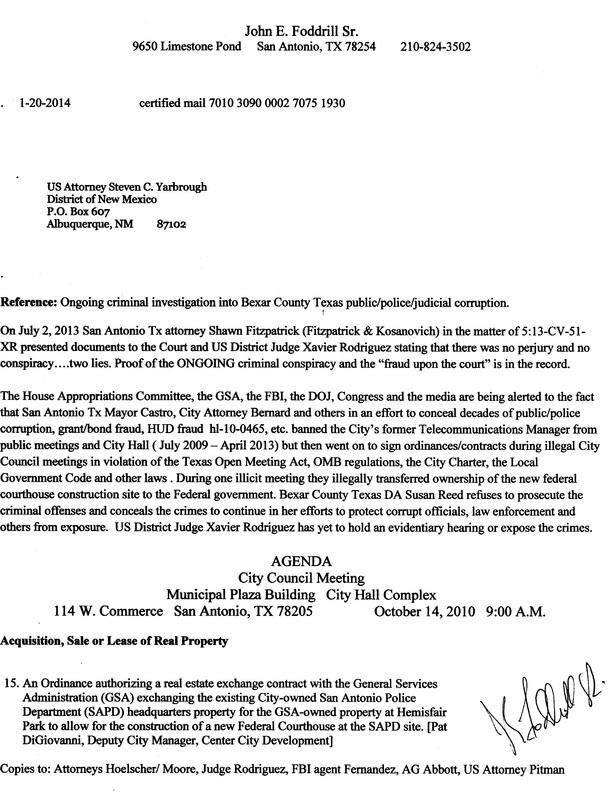 City Council, the FBI, the DOJ and Judge Rodriguez were provided with information concerning the Courthouse Scandal and the underlying criminal activity....... They ignored our correspondence. 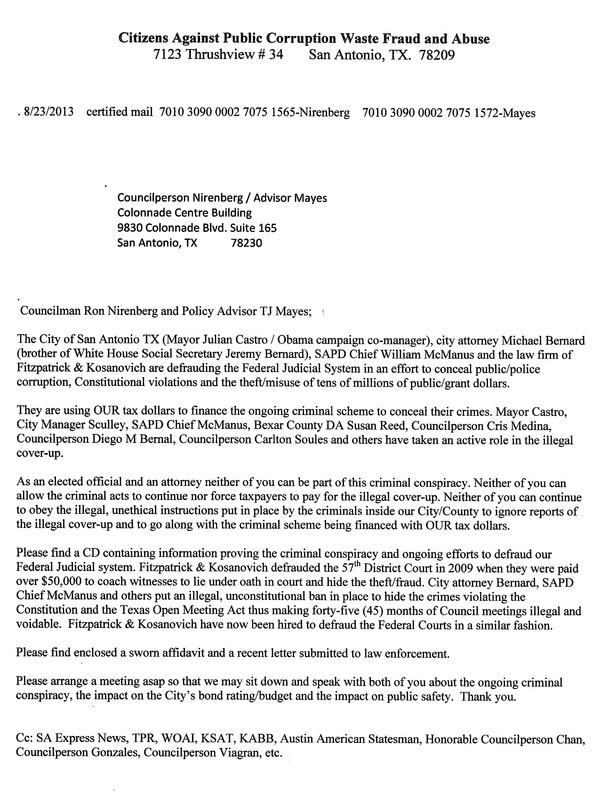 Councilman Ron Nirenberg is provided with additional information concerning the Federal Courthouse Scandal and other criminal activity......Nirenberg ignores our correspondence as usual.